Here is another snapshot of a day in the life of yours truly in Paradise. 7.00am as per usual is out in the garden clearing land – rocks, stumps and whatever. There’s a sign on the wall that says: “WORK: Pick up sticks . . . OR . . . Pick up stones!” One or the other are sure to be on the work list. In this panorama I’m currently clearing the land to the left of my Faleo’o ready for grass and more, yes more Hibiscus (Rosa Sinensis) that I’ll be growing from seed I imported from Tahiti and the USA. It’s taken more than a week to clear this section of land working 2-3 hours at a time working to avoid the hot or humid times the day. I leave large rocks in the ground and dig/winch out anything I can move with a couple of 1 ton chain blocks and strops. It’s hard physical work but the result is worth it! 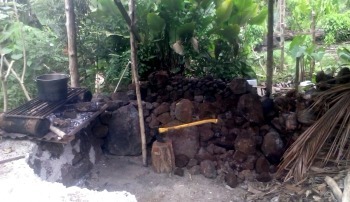 The Umu Kuka (outside fire-oven kitchen area) is constantly undergoing its second reconstruction programme. The first one lasted a couple of years then when the posts rotted, I replaced them with good Poumuli hardwood posts that I’m told will last many years. Recently I’ve been rollign and winching the rocks into place to build a rim of concrete/stone half-height walls and bench/tables around the perimiter. Cooking is on fire (centre) and the piles of sones from the last couple of days are right of the axe. Today I spent an hour twisting No6 fencing wire into a hook to lift up the grate/grill for easier fire starting and making a wire hook/hanger that can be used as a handle to pick up hot posts without requiring oven mits or Samoan-style hands! Fuel is a mixture of dried Kamaligi/Tamaligi wood and coconut husks. Nothing is wasted. 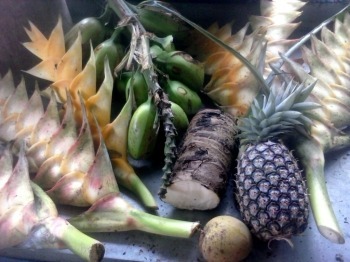 A trip into the plantation returned the above produce, more than enough for one day. 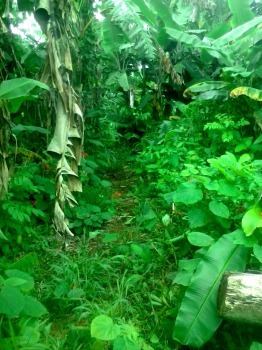 The green photo is of the Plantation Trail that leads down to five off-shoot paths to the left, numbered of course . . . Tasi, Lua, Tolu, Fa and Lima. Today I worked my way down getting as far as Tolu then back to Lua. This returned three bunches of bananas for me (two lovely Fai Samoa bunches and one of my favourite Pulukamu), some coconuts, two small bunches of bananas for the pigs and a small Taamu – enough for a couple of days eating by one person and left overs for the dogs. Pulukamu is a transliteration of Bubble Gum and the banana has a slight chewy-ness to it with a gentle difference to the taste. I can now tell the tastes, look and texture of the various bananas and grow all seven of the varieties that commonly grow here in Samoa. 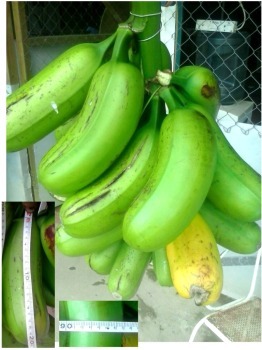 The inset shows the size of these bananas, they are huge at 80mm diameter and 200mm in length. All guests go “Wow! Look at the size of them!” when they first see a Fai Samoa – everyone. I will ripen them and then freeze them when they go yellow/brown, then eat them like an iceblock or ice-cream. Divine! The pigs got their coconut for breakfast, as per usual. Meet Suka, Suka and Suka. Yup the guy I got them off answered my question, “What’s her name?” on the first delivery with Suka. Same thing on the second delivery . . . to which he explained that they’re all called Suka so that when he calls them they all come. At this stage they still run away to the back corner of the pen when I call them but that will change in due course as they learn to be petted a bit more. Sad when they’ll all end up for dinner one day eh? 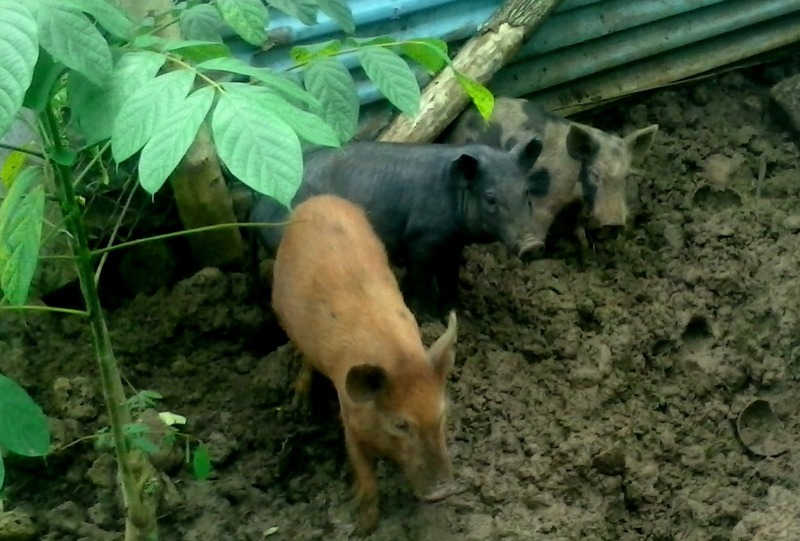 They’re happy with the recent rain – mud! 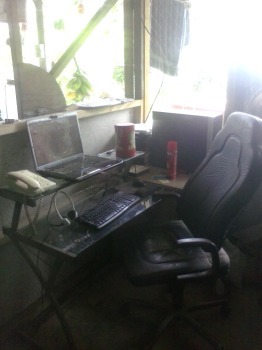 My office where the blogs originate, where my Tipline terminates and the home of investigations, research, marketing, thinking, international communications and suchlike! It normally sports a hanging mosquito net but that’s down while I’m tidying up and finishing the construction in preparation for a fixed mesh netting around the office in the next week or so. Today’s blogging ‘work’ included this post done late afternoon [a good hour or more], and in the morning (after a couple of hours on the land) a write-up from the Tradeqoin update where they announced recently that they had reassessed their business plan and devalued the Tradeqoin company, lowered their crowdfunding ask and so on. This took me about 3 hours including research work, analysis and writing. 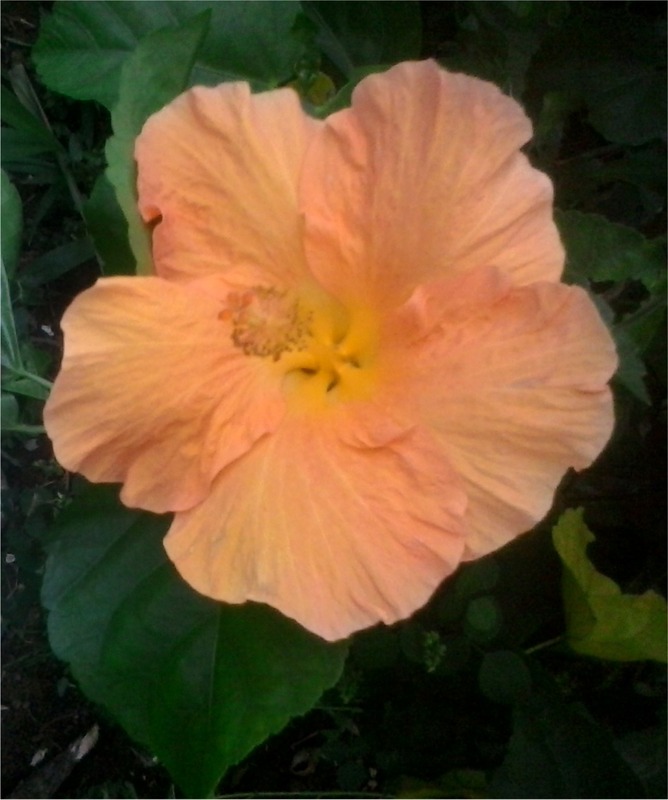 This is one of the more unusual Hibiscus colours in Samoa, one I call Samoan Orange Estate. I only have one plant which has produced its second bloom but it’s healthy and will produce some good wood for propagation in due course. I’ll finish the day with a couple of hours setting up the Hibiscus seeds for growing in cardboard egg boxes and plastic seed trays. I’ll be cooking a chicken and Taamu soup (normally chicken & Taro) on the umu kuka fireplace and probably a game of cards and a little bit of time ‘tickling the ivories’ on the piano to finish out the day and week. Saturday morning is into town for shopping. Frozen chicken, matches, curry, bread and onions are the items on the list so far. That’s a wrap from me with a nice little check out from a day in Paradise! Familair desk! We have the same glass desk in our home office only we have the corner setting, the L shape. Funny that – the desk was Aussie supplied from The Stationery Warehouse in NZ. Bet you don’t have the bananas hanging out the window though – one bunch around 20kg!